Wye Valley Services, based in Maidenhead Berkshire, offer high volume precision CNC turning upto 51mmØ in stainless steel, aluminium, copper and plastics to tolerances of 10µm for the automotive, food, medical and petrochemical industries. We specialise in the provision of high volume repetitive precision CNC turning services, offering the manufacture of complex mill-turned components quickly and reliably using the latest technology. We operate bar fed, sliding head machines with multiple spindles, back end working, 'c' axis milling and multiple turning tools. Our facilities run 24/7 allowing us to reduce our lead times, costs and predict job length more accurately whilst still producing the highest quality components possible to exacting tolerances. The key strength of Wye Valley Services Ltd capacity is its ability to offer single hit machining on sliding head machines in high volume. By combining CNC mill/turn capacity with a sliding head by way of the Citizen L20 machines of which Wye Valley services has 3, we can supply small precision turned components quicker, at a lower price and with a superior quality to those being produced on multiple machines. 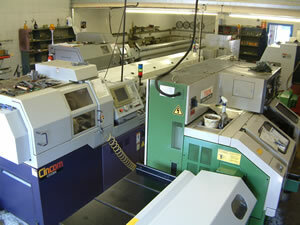 We operate 3 sliding head and 2 fixed head CNC turning machines offering us 840 man hours/week capacity. In addition to our CNC turning capacity we also have an assortment of manual lathes, mills, drills, grinders and inspection equipment. We hold a large stock of bar allowing us to provide a fast turn around on urgent jobs, as well as providing a stock holding service for clients that require a kanban or scheduled supply service. We operate a policy of continuous development and investment in order to maintain the high quality of our finished product and ensure repeatability and reliability. 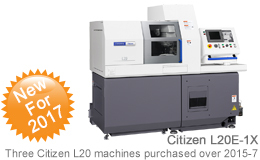 July 2010 sees the delivery of a brand new Citizen A32 offering Ø32mm 7 Axis capability and 30% higher productivity compared to older machines. Wye Valley Services Ltd is a family run business. This means that the companies overheads are much lower than most of the larger machine shops around the country, a saving that is passed on to its customers. Established in 1990, Wye Valley Services has over 16 years of experience in the field of CNC precision turning which means that we understand your requirements be they speed of service, design and production issues or the need for stringent quality control. Where ever you take your precision turning work, make sure you have a competitive quotation from Wye Valley Services first.